Quezon City, the Philippines | Walk with us! After a trio of flights lasting two, 12 and 4 hours I was a weary traveler when I finally landed in Manila Friday night. I was warmly greeted by Fr. Delio, the head formator, and Sergio and AJ, two of our students. Metropolitan Manila has around 12 million people, and even at 10 p.m. the mass of cars, motorcycles and jeepnys was bumper to bumper. We drove past highly developed shopping and nightlife areas with advertisements like you might find in Times Square, as well as row upon row of densely packed cinder block and corrugated metal homes. As with any part of the world, the contrasts between the “haves” and “have nots” is striking. The SCJs have 15 theologians studying at one of three area seminaries and living in community. 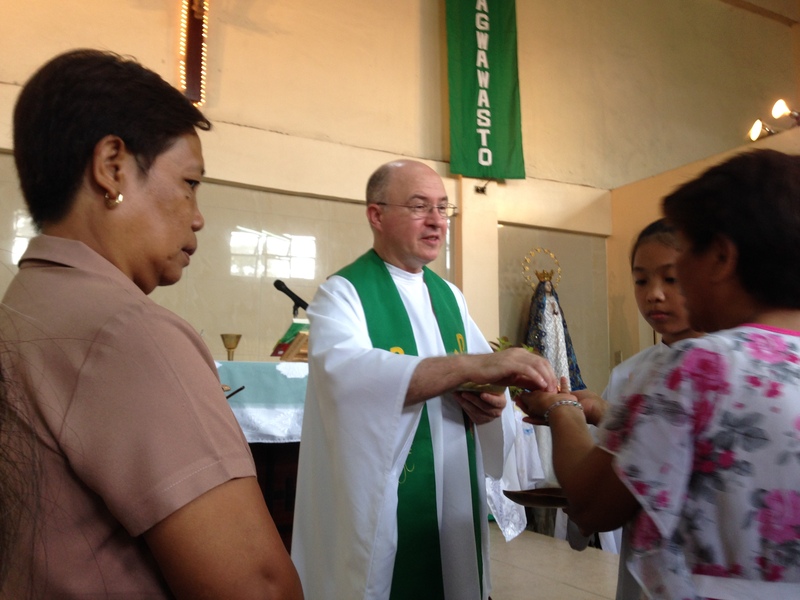 Those in final vows hail from Argentina, the Philippines, Poland and Vietnam. Most of the students are native Filipino, joined by four Vietnamese and one Brazilian. The first Saturday of the month is a day of recollection for the students. They left for a nearby retreat center to discuss their Community Plan of Life. Each of them shared how they are trying to be faithful to the SCJ Rule of Life in relation to the individual and community goals they have set for the year. Looking at their community life and dedicated prayer routine challenges me to look at how I can also improve. Fr. Indra invited me to Mass at the parish just a five-minute walk from our house. I noticed no parking lot and everyone was walking to church as those who arrived early prayed the rosary, which was broadcast over loudspeakers to the neighborhood. The music, lead by a youth choir, was quite melodic. While Mass was in English, many of the songs were in Tagalog. In a devotional custom new to me, instead of shaking hands the parishioners lightly grasped my hand and gently raised it to their forehead for a blessing. The prayer and devotional life here are rich with art, decoration and communal prayer. My favorite part of being here is sitting at table with the scholastics and hearing how they came to the SCJs, and of their hope and dreams for the future. While the needs here are great, the members also have a missionary spirit. One of the more recently ordained priests is preparing to go to the SCJ region in Finland, where perhaps 30% of the Catholics there are Filipino. The community of 20 shares two cars, so rides have to be coordinated. One of the vehicles is both truck and van which seats 15. Navigating that through winding marketplaces full of bikes and people carrying poles with goods balanced on each end made me glad I wasn’t the driver! Sunday Mass was celebrated in a church packed with mostly young people who walked from the surrounding neighborhood. In the States we often comment on the graying of our congregations, but here 95% of the crowd had a full head of dark hair. People sang and prayed with gusto. When the gifts were brought up I noticed several useful food items to keep the parish priest fed. 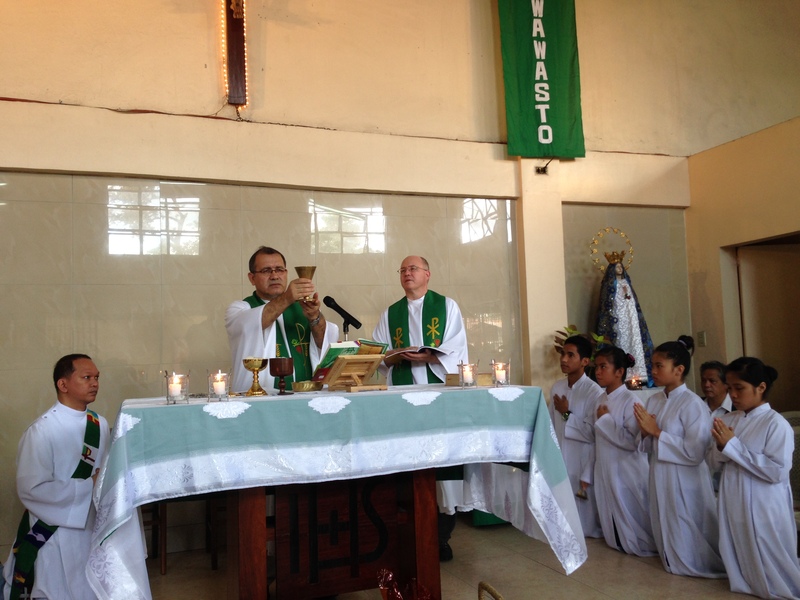 I followed along as best I could since this Mass was in Tagalog. I got a quick crash course so I could at least say “Katawan di Christo” as people approached to receive our Lord in communion. The closing procession included a blessing with holy water as we made our way down the aisle. At most sprinkling rites that I’ve done people try not to get wet, but here people raised their hands to make sure water came their way. Afterwards, I was surrounded by parishioners thanking me and asking for the hand to the forehead blessing. Part of the area we drove by included the House of Representatives, an impressive modern complex in what was once the capitol. Nearby was a huge garbage dump area where people scavenged for items to recycle so they could earn, at least their daily a bread. The contrast was striking. Close to home we stopped to see the campus of the School of Theology. 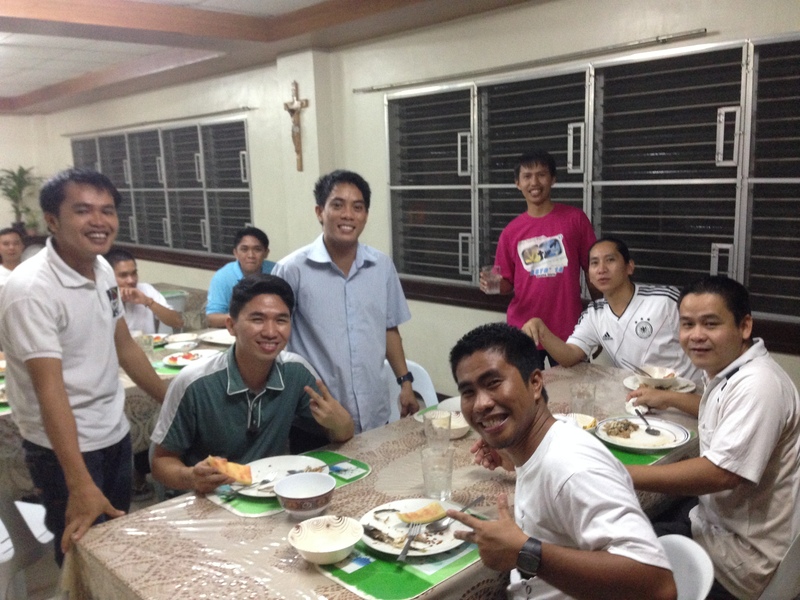 We arrived just as their parish Mass was ending and we were invited to stay for a meal in honor of the parish feast day. I was treated to a smorgasbord of dishes, with many fruits and vegetables new to me, but all deliciously prepared. Today the students got back into their school day routine. Most are up well before sunrise as adoration began at 5:45 a.m. When I worked in formation students complained about a 7:30 a.m. start to the day! Prayer is slowly prayed in choir accompanied by piano, guitar and percussion, as several students share their musical talents. Students take turns cooking breakfast, which consists of rice and a few accompaniments. Today, Sergio’s specialty was a beef hash mixture, with fish on the side. I have eaten quite well here, but did take a pass on fish so early in the day! While they are in school the plan is for me to learn more about our parish outreach projects. Steve, Thanks for sharing your observations and reflections. To me it is a very good sign that the U.S. province is connected in so many ways to the Philippines, Viet Nam and Indonesia.